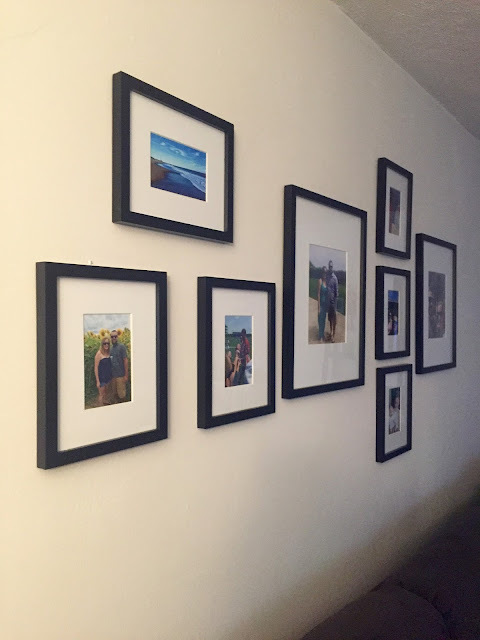 One of my favorite editions to our apartment is our gallery wall. 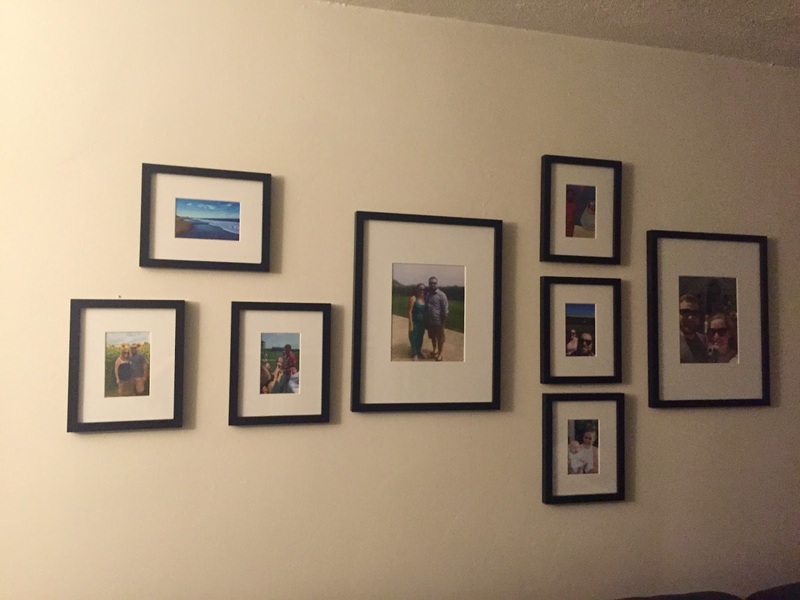 We started one with just five pictures and are slowly adding to the wall to create a place to showcase our adventures together. 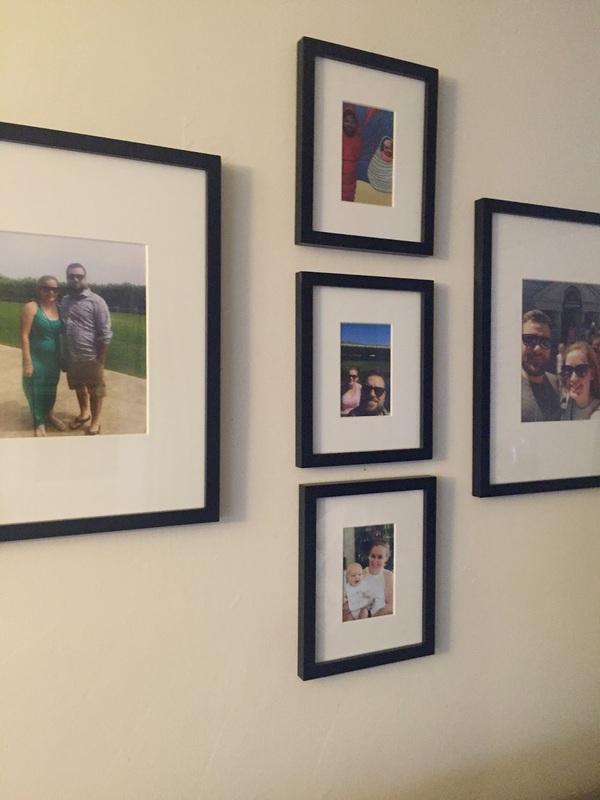 My main issue when adding to the wall is I don't want it to only be pictures of the two of us. I think it would just make us look pretty lame! On Saturday I grabbed my electric screwdriver and started hanging three new pictures on our wall. It started off with me screwing into my pinky finger...but ended with all three successfully on the wall. Since I'm a little OCD I knew that even if everything isn't even, it all needs to be in the same type of frame. My OCD cannot handle gallery walls where everything is different. Consistency is key for me. The top picture is a photo I took on Charlestown Beach at the Breachway. During the early days of our relationship Tim used to drive me home from dates and ask if I was ready to go home...I would say no because I wasn't ready for the date to be over and we would end up down at the beach late at night just talking in the car. So sweet right? So although that particular picture wasn't taken while we were together it is certainly a place that reminds me of our relationship. Below I have a picture from Buttonwoods Sunflower Field from last summer. We went and saw all the sunflowers in bloom last summer and it's a cute picture of us from that day. I also have a picture of the side of Tim's head and Tom Brady. This was the only picture Tim requested be put on our wall because it was the closest we've ever been to Tom Brady. Last summer we went to a Patriots practice and Tom came around signing and taking pictures after practice ended. Although he didn't interact with us at all it was super exciting and Tim loves that picture. As for what was already on the wall....We have a picture of the two of us on Easter in Florida when we visited my parents. The top picture is of Tim and Emma at the park over the summer. There is a picture of us kayaking on Wood River this summer and n the bottom is a picture of Emma and I on the day of her baptism. Finally, on the end is a picture of us at Harry Potter world in Florida. I just love being able to look at all of these memories and know there are so many more for us to create! There are many other pictures that could be featured here as well and I had a really hard time picking what would place up here but I know that the wall will change and grow with time. I plan on continuing our gallery wall here at our apartment and again in the future when we own a home. I tend to favor actual photos to paintings or anything along those lines. 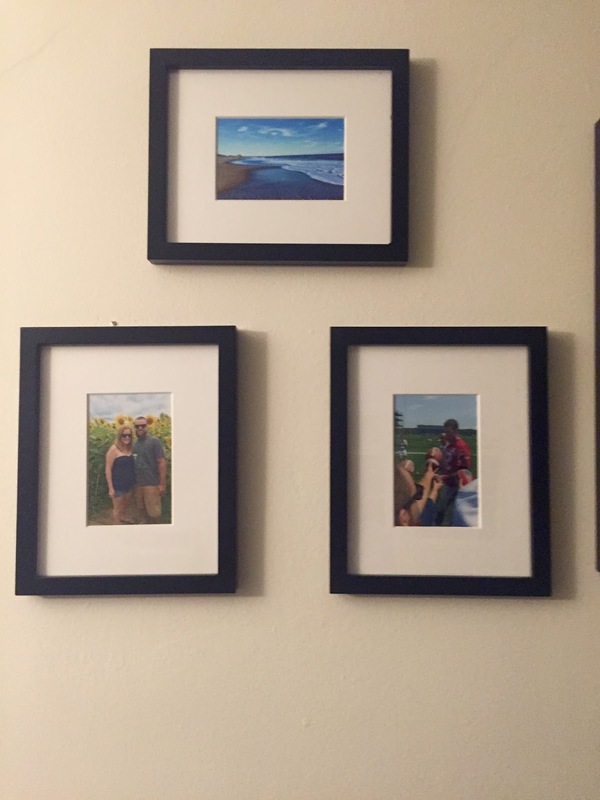 Photos are more real to me, where a painting just doesn't feel as right on my walls. So. That's what our gallery wall looks like so far, I'll keep you updated as we add/change anything!